What does a gallery devoted to portraits of famous British people do with those whose identities have been disputed since their acquisition last century, now being classed ‘unknown sitter’? The National Portrait Gallery have dealt with this dilemma in a particularly creative way by asking seven well-known writers to imagine the lives of these 16th and 17th century men and women based simply on what they look like and how they’re shown. Alongside but separate, a completely different process was going on as Curator Tarnya Cooper worked with Dr Tatiana String and her MA students of History of Art at Bristol University to research each painting, comparing similar portraits of the period, costumes and iconography and dating the unknowns as accurately as possible. They made practical use of their skills in the National Portrait Gallery’s own remarkable Heinz Archive – a resource I have used for many decades but which is really not well enough known. The result is a fascinating exhibition of all 13 portraits (with comprehensive detailed labels) at Montecute, near Yeovil in Somerset and a book of the imagined lives by John Banville, Tracey Chevalier, Julian Fellowes, Terry Pratchett, Sarah Singleton, Joanna Trollope and Minette Walters. Since 1975 the National Trust have been collaborating successfully with the NPG to display Tudor paintings, which would otherwise languish in store, in the glorious setting of this Tudor mansion. One especially interesting example is the portrait formerly though to be of Sir Thomas Overbury. 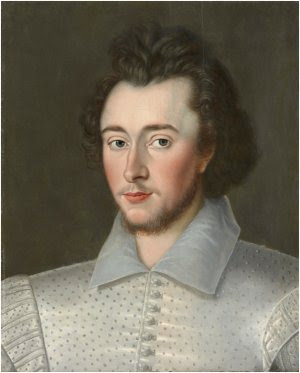 Extensive student research now shows that both facial likeness and provenance of the painting make it more likely to represent Sir Robert Dudley, the illegitimate son of Queen Elizabeth’s favourite, the Earl of Leicester. The panel painting, which has been cut down on 3 sides, came to the NPG in 1933 from Ditchley, Oxfordshire which was part of the estate of Robert Dudley’s godfather. This portrait is the subject of Tracey Chevalier’s Rosy in which she imagines the love life of the handsome flushed young man. The imagined lives process mirrors that of researching paintings for book covers to find a portrait from a particular historical period, preferably of an unknown sitter, which reflects and illustrates as closely as possible the description of a fictional character. Every picture tells a story one way or another.